The top U.S. diplomat in Africa met over the weekend with leaders in Uganda to express concerns about an anti-gay bill pending before the country’s parliament that could be headed for a vote as soon as this week, according to the State Department. Victoria Nuland, a State Department spokesperson, said during a daily briefing Monday that Assistant Secretary of State for African Affairs Johnnie Carson met with high-profile leaders in Uganda “over the weekend” and raised concerns about the bill, which among other things would punish homosexual acts with life in prison. The questioning was initiated by the Washington Blade. Movement on a draconian anti-gay bill in Uganda is raising concerns the legislation may be headed toward passage in the coming weeks, although it’s questionable whether the infamous death penalty provision remains in the bill. Mark Bromley, chair of the Council for Global Equality in the United States, said the legislation — which has drawn the ire of the international community for its proposed incarceration of gay people and concerns it would institute the death penalty for homosexual acts — seems likely headed for a floor vote in the coming weeks before the legislature adjourns on Dec. 14. Media reports indicated that the bill on Friday had passed the committee of jurisdiction in the Uganda parliament. Frank Mugisha, an activist coordinating Sexual Minorities Uganda, issued a statement to supporters on Friday decrying the legislation just before the committee acted on it. Thank you to the International Gay and Lesbian Human Rights Commission for this informative statement on the vote. (New York) An international coalition of organizations dedicated to human rights celebrated yesterday’s historic vote in the Third Committee of the United Nations General Assembly to pass resolution A/C.3/67/L.36 condemning extrajudicial, summary or arbitrary executions. The vote reversed the events of 2010 when the same body voted to strip the resolution of reference to “sexual orientation.” The UNGA also expanded upon its commitment to the universality of human rights by including “gender identity” for the first time in the resolution’s history. The resolution, which is introduced biennially in the Third Committee, urges States to protect the right to life of all people, including by calling upon states to investigate killings based on discriminatory grounds. It was introduced by the Government of Sweden and co-sponsored by 34 states from around the world. For the past 12 years, this resolution has urged States “to investigate promptly and thoroughly all killings, including… all killings committed for any discriminatory reason, including sexual orientation.” Apart from Human Rights Council resolution 17/19, it is the only UN resolution to make specific reference to sexual orientation. This year, the term “gender identity” was added to the list of categories vulnerable to extrajudicial killings. 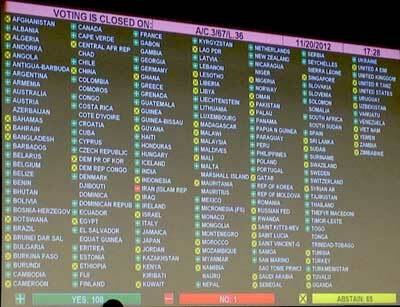 At Tuesday’s session, the United Arab Emirates, speaking on behalf of the Organization of Islamic Cooperation, presented an amendment that would have stripped the resolution of reference to “sexual orientation and gender identity” and substituted “or for any other reason.” The UAE proposal was rejected in a vote with 44 votes in favor, 86 against, and 31 abstentions and 32 absent. Another failed effort, led by the Holy See, would have stripped all specific references to groups at high risk for execution; however it was never formally introduced. The Third Committee also retained language expressing “deep concern” over the continuing instances of arbitrary killing resulting from the use of capital punishment in a manner that violates international law, which some States led by Singapore attempted to have deleted. The Singapore proposal was rejected in a vote with 50 votes in favor, 78 against, and 37 abstentions and 30 absent. The United States has been re-elected to the UN Human Rights Council and yesterday the U.S. Department of State released a statement highlighting the accomplishments during its first term. They note country-specific situations such as Syria, Libya and Burma among others. The statement goes on to list accomplishments in promoting universal human rights such as freedom of assembly and internet freedom. The release also highlights the work done to advance the rights of LGBT people around the globe. Advancing the Rights of LGBT Persons: In June 2011 the Council adopted the first-ever UN resolution on the human rights of lesbian, gay, bisexual and transgender (LGBT) persons. This resolution commissioned a groundbreaking UN report on the human rights abuses that LGBT persons face around the globe, and has opened a broader international discussion on how to best promote and protect the human rights of LGBT persons. As a co-sponsor of this resolution, the United States demonstrated its commitment to an active role in ensuring fair treatment and equality for all people.